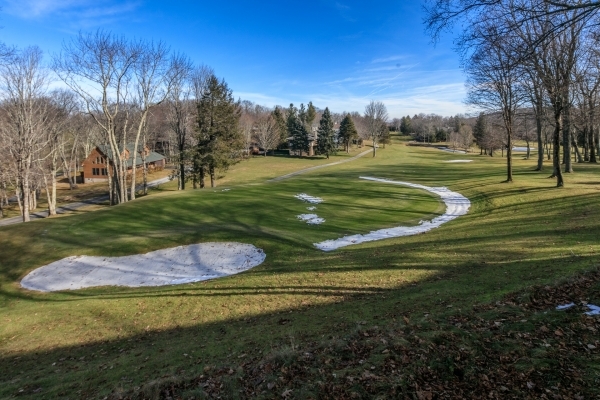 Beech Mountain Golf Course Home. Recently Updated. Fabulous views overlooking the golf course, at the 6th Green, with Pond and beautiful Lighted Water Fountain. The home has recently been updated, with all new Kitchen Appliances, Granite Counters, New Washer and Dryer, New Leather Furniture, New Lighting. New Wood Floors in Living Room, Kitchen, Master Bedroom, and Guest Bedrooms, 2018. Full 2 Car Detached Garage and smaller Golf Cart Garage and Workshop, in the lower level of home. Drive your Golf Cart right out onto the 9th Green. Less than a mile to the Ski Slopes. You could not ask for a better location. The home is being sold fully furnished with few exceptions. Club Membership is Current. Buyer pays New Member Transfer Fee of $500., during promotion period. The Large Family Room has a Full Bar, Bumper Pool Table, with plenty of room for a full size pool table and a ping pong table. Glass Siding Doors open out onto the Golf Course. A great all season home, waiting for a new owner! Owner financing is available.